Heat oven to 400°F. Spray 13x9-inch (3-quart) glass baking dish with cooking spray. 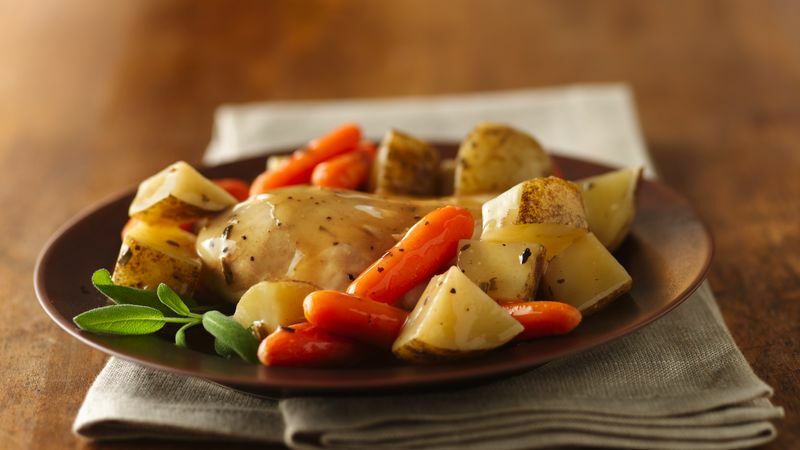 Arrange chicken, potatoes and carrots in baking dish. In small bowl, mix gravy, Worcestershire sauce, sage and garlic pepper. Pour over chicken and vegetables. Spray sheet of foil with cooking spray. Cover baking dish with foil, sprayed side down. Bake 50 to 60 minutes or until vegetables are tender and juice of chicken is no longer pink when centers of thickest pieces are cut. You can use bone-in chicken breasts, but they will take a little longer to cook. Chicken is done when the juices are no longer pink when the centers are cut.